Will Sundays shows ever change? Moderator David Gregory listens Secretary of the Treasury Timothy F. Geithner on "Meet the Press"
A new idea recently surfaced for television’s longest-running show: What if “Meet the Press” fact-checked what its stream of political guests said and ran the results online later in the week? Change comes slowly to the venerable shows that grip the attention of a small but committed segment of TV watchers every Sunday morning. And taking risks almost never happens, or why would ABC be negotiating with Ted Koppel, who at age 69 made his reputation covering Henry Kissinger and the Iranian hostage situation, to replace George Stephanopoulos as the host of “This Week”? “With occasional exceptions, the Sunday shows come across as geriatric and insular, having long been eclipsed and upstaged by Jon Stewart, Stephen Colbert, Bill Maher, Fox News, MSNBC and much of the Web,” New York Times columnist Frank Rich, a frequent critic, said in an email to POLITICO. The shows still occasionally make news – just ask Homeland Security Secretary Janet Napolitano, who made herself an instant national target by declaring on CNN’s “State of the Union” that “the system worked” in the case of would-be terrorist Umar Farouk Abdulmutallab. But even aficionados of the genre say the shows have declined since the death of Tim Russert, the “Meet” host who brought a sophisticated knowledge of politics and sharp questioning style that no other hosts have been able to duplicate. Rosen recently wrote that “the Sunday shows are broken.” If so, how can they be fixed? We asked a range of journalists and media experts. Their responses tended to fall into three distinct camps. By far the biggest complaint is the scarcity of the young, the female and the non-white. It’s true that the Sunday shows haven’t taken advantage of Washington’s crop of younger pundits. But it’s not as if there’s been no new blood. This past year, MSNBC’s Rachel Maddow made her first appearance on “Meet the Press,” with author and blogger Michelle Malkin joining the panel on “This Week.” Both appearances coincided with an uptick in the ratings, but such additions seem to be the exception more than the rule. Moulitsas also criticizes the shows for repeatedly bringing on guests such as Senator John McCain, seemingly oblivious to the fact that he suffered a crushing defeat in the presidential election only 14 months ago. Besides Bob Dole, McCain has the most “Meet” appearances of any politician. The frequent appearances of David Broder, regarded by Rich and others as the epitome of conventional wisdom, get the same criticism. The Washington Post columnist has made over 400 stops on the NBC show. Richard Prince, who writes “Journal-isms,” a column on diversity in the media for the Maynard Institute, focuses on the preponderance of white males on the shows. “There’s more diversity in the White House than on the talk shows,” he said. The National Urban League addressed the issue a few years back in a study titled “Sunday Morning Apartheid,” where the organization found that just eight percent of over 2,800 Sunday morning guests were black. The study noted that “Fox News Sunday” regular Juan Williams accounted for 40 percent of appearances by black guests. PBS’s Gwen Ifill, a former reporter for the Washington Post and New York Times as well as NBC News and currently the host of “Washington Week,” would seem to have the ideal qualifications for one of the network Sunday shows. And, as a woman and African American, she would be a distinct departure from the succession of white men who have hosted them. But NBC chose Gregory, its White House reporter, to succeed Russert, and ABC, in negotiating with Koppel, is presumably kicking a decision on a permanent successor down the road. The basic formula of a host asking a public official questions, followed by a panel of reporters and policy wonks, seems to have outlasted every major change in culture and technology since the Truman years. Michael Kinsley, former editor of The New Republic and Slate, and the one-time liberal host on “Crossfire,” said there are several problems with the traditional format: hosts feel obliged to affect a non-partisan, objective posture; journalists on the panel feign expertise over a wide range of issues; and the questions asked are often of the “gotcha” variety. “What passes for a tough question is too often just about generating a headline or moving the story along a step,” Kinsley said. CNN actually did change its Sunday morning format last year, with John King shepherding a four-hour block that includes traditional newsmaker interviews, journalist panels, and Howard Kurtz’s “Reliable Sources.” As an upstart, CNN has less institutional baggage, and tinkered a bit with the standard formula by, among other things, having King visiting all 50 states on “State of the Union.” With King heading to prime-time next month, CNN is also looking for a new Sunday morning host. Some view the Internet as providing the right space to discuss politics and policy, but not doing anything for the old Sunday shows. Reihan Salam, a writer and fellow at the New American Foundation, said that the future for “punchier, clever, smarter shows” covering public affairs could be online. “What you really want to see is more high-quality, niche programming,” he said. Some of the bigger names in politics are recognizing that fact, too. Sarah Palin, who has never appeared on a Sunday show, is able to get her views out to the public over Facebook and Twitter without having to sit through a Sunday show host’s follow-ups or answering for past statements in real time. Who says there’s anything wrong? 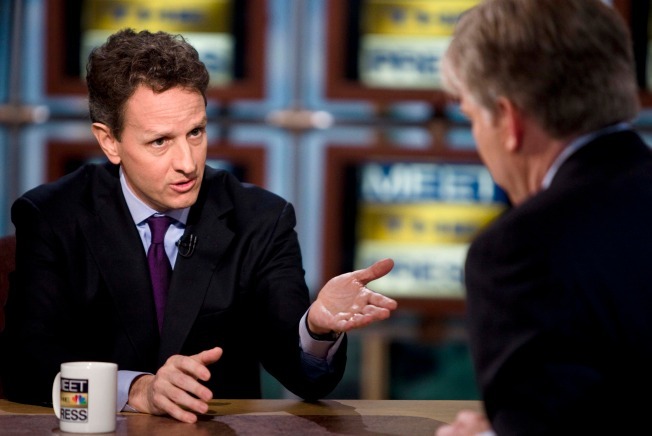 Even in the post-Russert era, “Meet the Press” remains the top-rated Sunday show, averaging 3.074 million viewers weekly in the fourth quarter of 2009. But week-to-week, it’s first place rank is less of a sure thing, as both “This Week” and “Face the Nation” may take the top spot in either total viewers or the age 25-54 demographic. Both shows are not far behind: in the fourth quarter, they finished with 2.740 and 2.618 million viewers, respectively. “Fox News Sunday” brought in 1.184 million viewers. Given that the Sunday shows attract an older viewership likely to be more resistant to change, there’s hesitancy on the part of producers to mess with the DNA. In addition, the guests—candidates, policy makers, members of the administration—come to expect an almost standard format. Schieffer, who has moderated “Face the Nation” since 1991, notes that the show hasn’t changed significantly since first broadcast over a half-century ago. He views that fact as attesting to the format’s longevity amidst the revolutions in how media is produced and consumed, and “see[s] no reason to make any major changes. Midweek fact-checking doesn’t do it for him either..
Syracuse professor Robert Thompson admits that Sunday shows are “terribly old-fashioned,” but notes the irony that debates over their relevance are popping up on Twitter. Since Sunday shows never really appealed to 20-year-olds, Thompson thinks that trying to skew younger or add new technology and graphics isn’t likely to work. “Even before cable and the internet, you wouldn’t have gotten younger viewers,” Thompson said. Given all the bells, whistles and holograms—hello CNN!—now employed on cable news, Thompson thinks that because of the simple Sunday show format, what’s old may actually be new again.